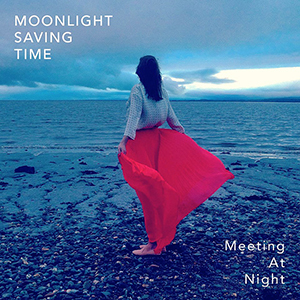 THE HIGH TINGLE FACTOR created by a significant arrival on the British contemporary jazz scene is always rather special… and very much the case with Bristol-based Moonlight Saving Time. Taking their name from a quaint 1930s love song favoured by American jazz vocalist/pianist Blossom Dearie, this quintet first demanded my attention a couple of years ago at Manchester Jazz Festival. As they launched into their opening number, from an early five-track EP, there was the sense of a defining moment as the charismatic presence of singer Emily Wright illuminated front-of-stage with her particularly expressive, silken storytelling. Yet this is only part of the story, for MST’s distinction is its ability to combine Wright’s eloquence with a seriously creative team of improvising instrumentalists – trumpeter Nick Malcolm, pianist Dale Hambridge, double bassist Will Harris and drummer Mark Whitlam. Consequently, debut album Meeting at Night rejoices in an elegant synthesis of memorably original song, fine arrangement and crackling jazz extemporisation – a varietal, near-50-minute sequence which balances emotive atmospheres with sprightly charm. Frequently, the impression is of a gradual unfolding, with musical delights around each corner (rather than gleaning all there is to know inside the first minute), which surely is key to the band’s compelling performance here. The elegantly flowing, layered vocals of Emily Wright are revealed in bassist Will Harris’s opener Clouds, as it rolls and tumbles to snappy rhythms, bright piano runs and peppy trumpet lines, bringing the swift realisation of a new sound world. Title track Meeting at Night (the words of Robert Browning set to music by Wright and Harris) possesses a delicious vocal and instrumental unpredictability, with Emily Wright’s clear annunciation and theatrical delivery reminiscent of Cleo Laine or Annie Ross; and saxophonist Jason Yarde guests alongside trumpeter Nick Malcolm to infuse the number with improvisational high jinx. Lush harmonies in Will Harris’s brief Trio introduces the gorgeously lilting Silence is Here – again co-written by Harris and Wright, it shimmers to the purity of that unmistakable voice and the band’s dynamic ebb and flow, including effective multi-layered trumpet textures. One of the album’s surprises is pianist Dale Hambridge’s arrangement of great British composer John Ireland’s Sea Fever which, removed from its original baritone voice setting and offered to Emily Wright, retains all of its strong, evocative yearning. And following, Hambridge’s own Desire for Nothing Known dreamily waltzes to memorable vocal harmonisations and the pianist’s elegant elaborations, Mark Whitlam’s sparky percussion driving it on into greater complexity (and quite unlike anything on the current jazz scene). 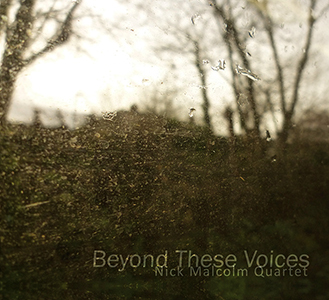 Jason Yarde features again in Nick Malcolm’s Views (a sumptuous development of a track from his own album Beyond These Voices), which floats to typically imaginative alto sax; and the tight, wordless vocals of Emily Wright, particularly when fused into sax and trumpet, become redolent of Norma Winstone’s earlier work with Kenny Wheeler. A Calvin Harris song – I’m Not Alone – is pure magic in MST’s hands; with an initial vocal folksiness (accompanied by Will Harris’s gently chordal and percussive accompaniment), it dissolves into the most ravishing, memorable ballad, mirroring the album art’s coastal longing – and thanks to Malcolm’s inventive trumpet, underpinned by Dan Moore’s Hammond and the drum precision of Mark Whitlam, it never descends into mawkishness. From My Window (courtesy of another current songwriting talent, Jamie Doe) shuffles to echoic vocals and Hambridge’s electric piano, embellished by the trumpet’s curious seagull cries; and from the pen of Emily Wright, closing track Arthur’s Dance possesses a sense of joyous journeying, its breeziness suggesting radio-play potential. A fine recording from a band with a great future, from both compositional and performance perspectives, Meeting at Night is already (in this final quarter of the year) prompting thoughts of the year’s best album releases. Released on 2 October 2015, it’s available in CD and digital formats from Bandcamp, as well as from online retailers and record stores.